“Parsons Crossing,” known as “where Minihane’s used to be” to everyone else, is the potential site of 60 apartments, retail use and parking. The proposed development, at the corner of Washington and Parsons Street, includes the former Minihane’s, the Commerce Bank building, and an adjacent house on Parsons Street which would be preserved. All told, we’re talking four stories, 60 housing units, 139 parking spaces and commercial space dedicated to the bank and some kind of “urban” grocery store. The BRA is hosting a meeting on Wednesday, December 4 at 6:30PM. It will be held at the Brighton Marine Hospital on Warren Street. You can find the submission to the city here, which includes a rendition of a quite substantial building. The pile of masonry that houses St. Elizabeth’s Medical Center continues to grow. The steel frame of the latest addition, three stories on top of the recently added three story emergency room, was recently completed. The new construction was part of an agreement that the owners of the for-profit facility, Steward Health Care a.k.a Cerebus Capital Management, agreed to when they bought the hospital. The Attorney General’s office, which oversees implementation of the agreement, has released a report stating that first year goals were met. Financially, the chain is losing money on its Boston area operations. Faced with opposition from neighbors and preservation-minded residents, the owner of 10 Parsons Street, Babak Veyssi, has decided to withdraw his application to demolish the property. In his letter to city representatives he stated his desire to incorporate the house into his plans for the site, which includes the adjacent property that formerly housed Minihane’s Florist. Upper Parsons Street was cited in a Mass. Historical Commission survey as possibly eligible for National Register of Historic Places status. Kudos to the Brighton Allston Historical Society, neighbors and Charlie Vasiliades for their work on this. And to Mr. Veyssi for reversing course and pledging to work with the community. 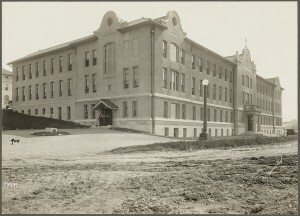 St. Elizabeth's Hospital, circa 1915. What is perhaps one of the ugliest buildings in Boston is about to get bigger. The BRA has approved a three-story addition to the emergency and urgent care building at St. Elizabeth’s Medical Center. The expansion will add 23 beds to the current 252. A bit of landscaping is also planned, but it will be behind the new addition. Can’t have greenery disturb the fortress-like structure looming over Brighton Center. Dash Cafe has opened in Brighton Center, on Henshaw Street next to the police station. Breakfast, lunch and take-out are offered, and a brunch menu will be added for weekends starting the end of May. If your peace of mind centers on your iPhone, you may want to call this guy if something goes wrong with it. (The Globe article may be behind a paywall, sorry.) Curt Ingram operates his repair shop on Washington Street in Brighton Center, above where Minihane’s Flowers used to be. Naked Pizza, a Brighton Center landmark for all of twelve months, will be closing next week. What will this guy do?